Hey parents: Looking for something exciting for the kids to do in July that will keep them learning while having fun at the same time? Register your kids for one of Kellogg Community College’s Summer Robotics Camps for youth! This isn’t science fiction – it’s real robotics! In Introduction to Lego Robotics, campers will learn the basic design concepts required to create functioning robots. They’ll also learn about different types of robots and where and how they’re used in the real world. During the last part of the camp, campers will be introduced to Lego Mindstorm sets and will have the opportunity to design and build robots that can perform certain tasks to complete challenges. This camp will engage campers in an exciting learning experience focused on the critical technology and design principles that can lead them to the careers of tomorrow. In TETRIX Robotics, campers will take their robot engineering skills to the next level. They’ll learn how to design and manufacture robots using advanced engineering techniques, including the process of designing and manufacturing parts to build a robot using the TETRIX Building System (a system used by FIRST Robotics middle school competition teams). Campers will also be introduced to the new TETRIX Prime kit that offers new features and exciting options for bringing robotic creations to life. Some experience with robotic design and engineering is encouraged, but not required. In the exciting Programming with ROBOTC camp, campers will actually learn how to control robots through a C-based programming language. After learning the basics of ROBOTC, each camper will be assigned a computer so they can put into practice all of their new programming skills using both virtual and physical robots. This camp is designed for any individual that wants to learn programming, and is ideal for FIRST Robotics team members who want to learn ROBOTC to program their robot during the competition season. In addition to the activities noted above for each camp, the Battle Creek Police Department’s Bomb Squad will bring their robot in for a demonstration at around noon Tuesday, July 14. 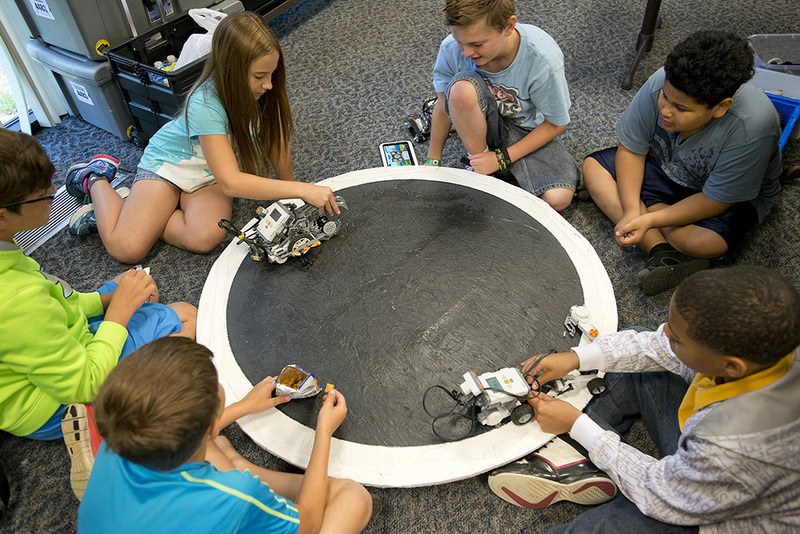 All campers – including Introduction to Lego Robotics campers from the camp July 6-9 – will be invited to participate. By mail with payment to Lifelong Learning, 450 North Ave., Battle Creek, MI. 49017. By email with payment info to ll-info@kellogg.edu. By fax with payment info to 269-565-2129. In person to the Lifelong Learning office in room 102 of the Ohm Information Technology Center on KCC’s campus at 450 North Ave., Battle Creek. You can also register by phone using a credit or debit card for payment by calling KCC’s Lifelong Learning office at 269-965-4134. Please make all checks payable to Kellogg Community College. Individuals who register for both Tetrix Robotics and Programming with Robot C can sign up for both camps at a reduced rate of $175. Campers participating in the Best Deal camps should bring a lunch to camp each day to eat between sessions. For more information, contact KCC’s Lifelong Learning Department at 269-965-4134 or visit www.kellogg.edu/bruin-bots.